It seems simple, right? Apply sunscreen to exposed skin before you go outside and you’re done. But it isn’t that simple: The when, where, and how you apply sunscreen is important, but often confusing. We’ve examined all the latest research and have definitive answers to your most burning sunscreen questions. Get ready to keep your skin protected and looking younger, longer! Nothing is as critical for keeping skin younger-looking, protected, and resilient as daily use of a sunscreen rated SPF 30 or greater. This is something Paula’s Choice Skincare has embraced with every sunscreen we’ve created. If your skin is exposed to daylight, even indirectly (in the shade of a tree or through windows), it needs sunscreen. When used as directed with other sun protection measures, sunscreen decreases the risk of skin cancer and early skin aging caused by the sun. What Step is Sunscreen in Your Skincare Routine? Most medical experts, regulatory boards, and scientists agree: Sunscreen is always the final step in your daytime skincare routine. This is exactly how sunscreens are tested to earn their SPF rating: Nothing goes over them. Any skin care product you apply over a sunscreen dilutes and reduces its effectiveness. Do you also need a moisturizer for under your sunscreen? Probably not. In addition to providing broad-spectrum protection, the best daytime moisturizers also have proven anti-aging and hydrating formulas. You shouldn’t need a second product if the one you’ve chosen is rated SPF 30 or greater, fragrance free, suitable for your skin type, and loaded with potent antioxidants and other skin-renewing ingredients. Antioxidants matter: Research has shown that skin gets an extra boost by applying an antioxidant-rich serum before your sunscreen. Antioxidants help further shield skin from environmental factors that slowly chip away at its youthful appearance. How Soon to Apply Sunscreen Before Heading Outside? When to apply sunscreen? Apply sunscreen 15 to 30 minutes before you go outside and be sure you let it absorb before you get dressed. If you get dressed immediately after applying sunscreen, much of it rubs off on your clothing, where it can’t help your skin. We repeat: You must apply sunscreen before you go outside. Waiting until you get to where you’re going exposes your skin to an incredible amount of damage. Research has shown that sun damage begins the first minute your unprotected skin sees daylight—not sunlight, but daylight! The common direction is to apply sunscreen “liberally,” but what does “liberal application” really mean? You’ll find measurement recommendations (1/2 teaspoon for your face, a shot glass full for your body), but they don’t really make sense. Why? Because not everyone has the same size body or face and not everyone has the same amount of skin exposed to daylight. • Spread a layer you can see over the areas of your skin that will be exposed to daylight. • Massage this layer into the skin. • If you’re planning a long day outside, apply another slightly thinner layer. One of the more confusing issues about sunscreen use is seeing label instructions to reapply every two hours. This is about regular face or body sunscreens—not water-resistant sunscreens, which have their own timeline for reapplication. With water-resistant sunscreens, you must follow the specific reapplication instructions for adequate protection after getting wet or perspiring. For daily use of regular facial moisturizers with sunscreen, the question is how can you reapply every two hours if you’re wearing makeup? Are you supposed to wash your face, reapply sunscreen, and then reapply your makeup only to do it all again in another two hours? That isn’t very practical or as it turns out, necessary if you are wearing a high enough SPF rated sunscreen and applying it LIBERALLY the first time! The two-hour recommendation came about because the research made it clear most people were not applying sunscreen liberally. Therefore, regulators followed the logic that if a person applies sunscreen again two hours later they’d be ensuring more adequate protection. BUT if you apply it liberally in the beginning, reapplication isn’t critical. The fact is that the SPF number is a time rating of how long you can be in the sun without burning. 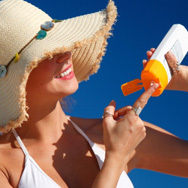 If a product is rated SPF 30 or greater, that’s going to be a lot longer than two hours for most people! Plus, the issue of reapplication is about being outside in direct light without seeking shade. If you apply sunscreen in the morning and spend most of your day inside (without your skin getting wet or perspiring heavily) and if when outside, you’re seeking shade, wearing sunglasses and hats with brims, your sunscreen should still be effective by the end of the day. This is because sunscreen actives break down in response to direct exposure to daylight, not just from the passage of time. Apply sunscreen liberally to all exposed skin 365 days a year. On long days outside wear higher SPF-rated products. You can also layer sunscreen products, especially for the face, by wearing a moisturizer with SPF + a foundation with SPF, and touch-up with an SPF-rated powder. You must wear water-resistant sunscreens when swimming or perspiring and follow the reapplication directions exactly. Reapply sunscreen to your hands after washing (keeps them looking young too!). Seek shade, wear UV-rated sunglasses and wide-brimmed hats. Wear sun-protective clothing whenever possible (it’s less expensive than applying sunscreen liberally all over an entire body in the long run). Do I Need Sunscreen If I’m Inside All Day? Yes! The UVA rays of daylight that are present year-round come through windows. If you think that just walking to your car and then into a store or office won’t damage your skin, think again; that few minutes of UV light exposure adds up over the years, causing your skin to age faster than you want. • Wait 3–5 minutes for the sunscreen to set before applying foundation. • Apply the foundation in smooth, downward motions, no rubbing back and forth. • Do not use excess pressure or over-blend. • It's even better when your foundation, BB cream, or tinted moisturizer contains sunscreen too— we love to layer sunscreen! What about relying on foundation with sunscreen on its own? That’s a fine way to get protection for your face if you apply liberally. If you don’t like that much coverage or how a liberal foundation application feels, then go back to liberally applying a facial moisturizer with sunscreen prior to makeup. A note on powders with sunscreen: Don’t rely on pressed or loose powders with sunscreen as your only sun protection. Getting to the point of achieving the stated amount of sun protection requires a lot of powder. Powders with sunscreen are a great way to touch up your makeup during the day, and for applying more protection at the same time! Cutis, December 2012, pages 321-326.